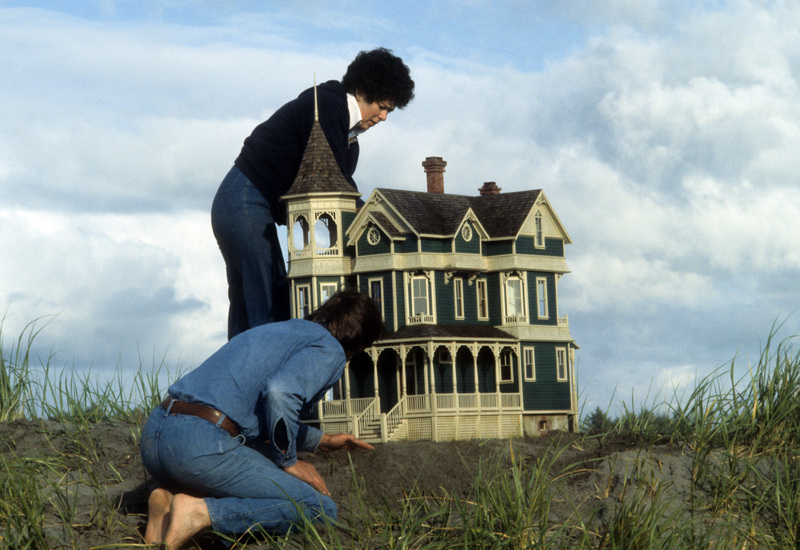 Miniature house #17 was The Oysterville, the second of three houses we built in 1978. #18 would make that 18 houses in 5 years—or 3+ per year. I think this was the first $6000.00 house, which boiled down to each of us earning almost .25 per hour. Yes, that’s cents, not dollars. I can’t comprehend those numbers. Somehow we managed to finish and deliver houses more or less on time, as well as have a life with our dog, a garden, summers with Noel’s daughter, my part-time job at the bookstore, and a social life. Since I didn’t start writing my column for Nutshell News until 1981, this and many of our Victorians are undocumented. 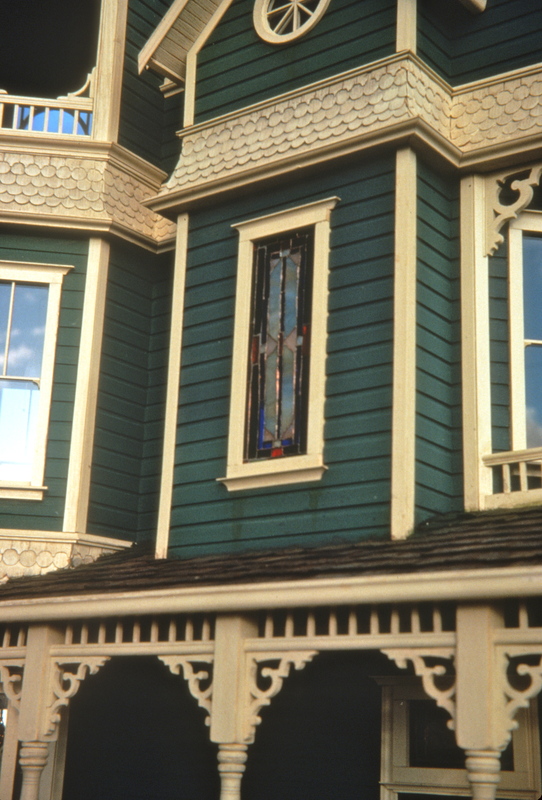 However, The Oysterville had an accident in a move from California to Washington in 1992, and I wrote about the house and repairs for the 12/93 issue, for those of you who collect them. More about that in another post. 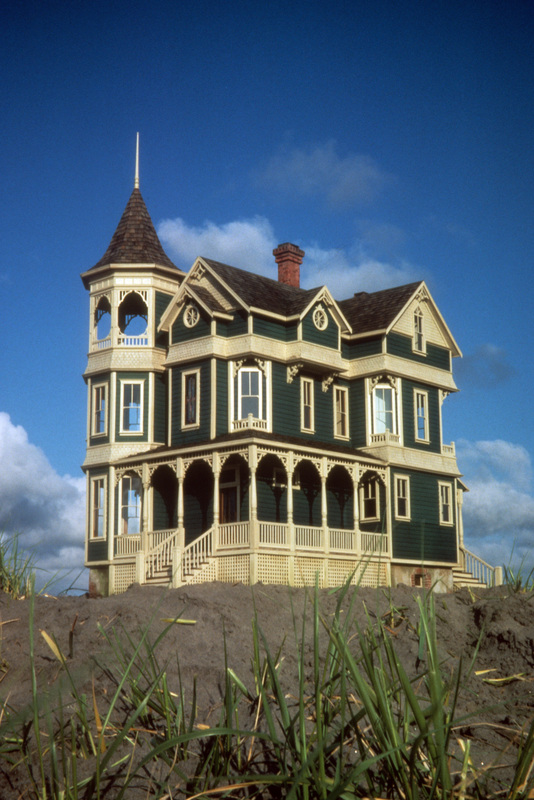 The Oysterville featured a 3-story tower with widow’s walk, fishscale (or scalloped) shingle banding, complex roof shapes, alcoves and gables, and Noel’s trademark elaborate gingerbread trim. His expertise at gingerbread was due in part to Jim Marcus, one of the all-time great miniature housebuilders (most notably the San Francisco Russian Embassy series) who told us about the wood gelutong, which I have written about in previous posts. It is a wood with no apparent grain, which makes for easy carving. Noel would cut a length of gelutong stock in the dimensions he wanted for the trim, then cut that into lengths short enough to fit the Dremel scroll saw. He drew his gingerbread design on one end of the stock, then cut it out on the Dremel with an extra fine blade. The block was then sliced like salami into the proper thickness for the gingerbread. He repeated the process as many times as needed. By 1978 we had become local celebrities. To our dismay, shop owners in town would suggest our studio as an attraction for tourists. For the most part these people were only out to gawk, and eat up an hour or more of our precious work time (or worse, our naps!). They thought they had come to see sweet little toymakers, instead they saw something they couldn’t comprehend–it just didn’t fit their expectations. It inevitably came down to the real question, “How much?” the answer to which invariably made them gasp, clutch their purses to their chests, and hurry out the door. The upside was some wonderful publicity from the press, including a lovely article written in The Daily Astorian (OR) by one Nancy Butterfield in 1984, which included a photo of The Oysterville. Unbeknownst to any of us, the photo and a few lines of her copy were picked up by “Ripley’s Believe It or Not.” They decided it was okay to name me Peggy, and their “artist” made a pretty poor line drawing from the photo (I guess to avoid copyright problems…) in which “Peggy” is enormous, and Noel looks about 10 yrs. old. 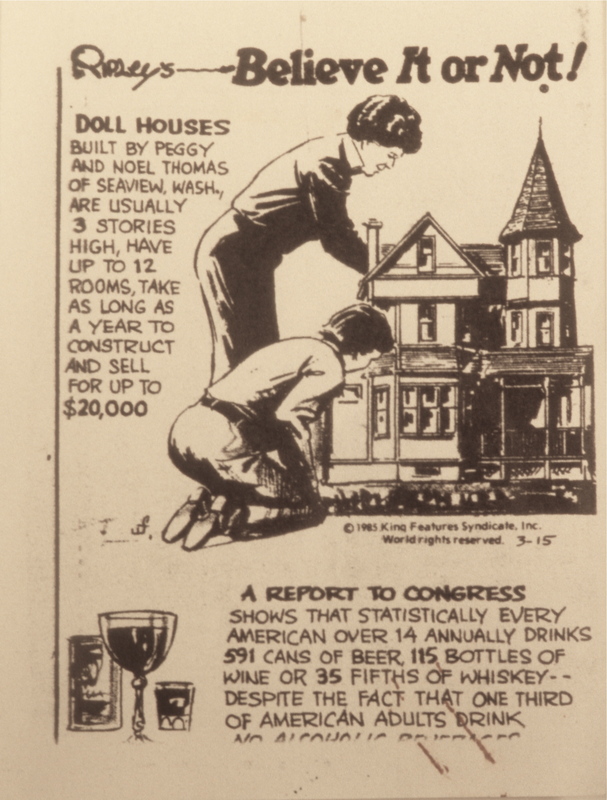 The worst was the obvious incredulity at these people selling dollhouses for “up to $20,000!” As far as we know it only ran once, on a child’s page in an Alaska newspaper, but once was enough for some miniaturist to see it and send us a copy. It remains one of our prized possessions. This entry was posted in Bio, Houses, Miniatures and tagged architecture, fishscale shingles, lifestyle, Ripley's Believe It or Not, The Daily Astorian, time & money, Victorian gingerbread, work style. Bookmark the permalink. I am loving your blog. How did you determine the price on your houses? Thanks, Jennifer. Pricing was like everything else–we’d try something out and see how it worked. We started at $1000, then $2000, then $4000, due to a friend’s nudging, since we were backed up with orders. Nobody blinked–we got orders for 3 more years and wished we’d raised it more. If we took 3-4 orders in one price, we’d edge it up. Collectors would tell us we weren’t charging enough! Basically we tried to figure out what it took us to live per month (not very much in those days! ), figure how long it took to build a house (it never went faster, quite the opposite) and go from there. All very scientific. Never had a business plan, just the luck of a lot of people wanting our work. and you were able to make this your living? That is awesome!! I am so impressed. We did, such as it was. As I say, we got incredibly lucky. I am searching for Jim Marcus ~ I am the owner of his only hardwood Russian Embassy, and I lost touch with him when we moved to Washington, DC. ~ I have been adding treasures to this masterpiece he created with the best of miniaturists from the Beginning of owning this house in the 1960’s (most of whom are no longer with us) through today….I would love to let Jim know the continuing JOY of loving his treasured creation….can you help me find him? Hi Lynda, The last time we saw Jim was at the Kansas City Toy & Miniature Museum, and that was a while ago. You might contact them and see if they have a current address. Thank you! I haven’t talked with Mary Harris or Barbara in a very long time either….hope they are still with us? I will let you know if I make contact….our mini world used to be so very close….